Top community discussions about Garden Shop - Rush Hour! Is there a better alternative to Garden Shop - Rush Hour!? Is Garden Shop - Rush Hour! really the best app in Strategy and War category? Will Garden Shop - Rush Hour! work good on macOS 10.13.4? 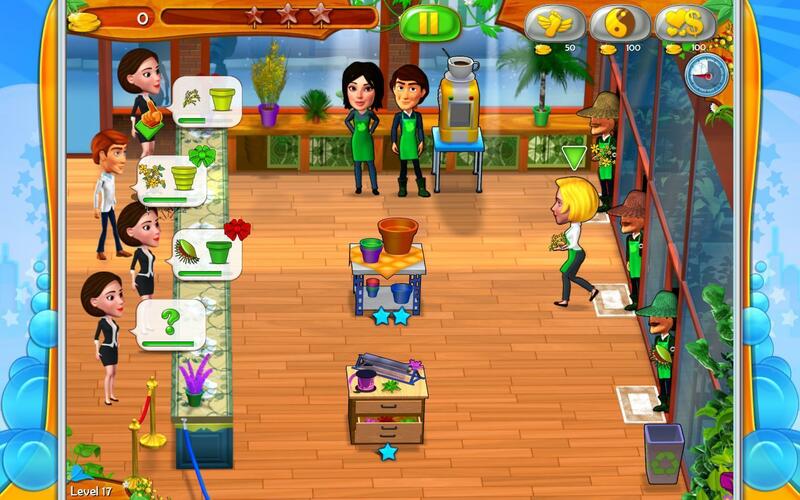 Help your friend Chloe sell her most beautiful plants in Garden Shop - Rush Hour! Develop your own plant and flower shop and make it prosper. With Chloe's help, take up several challenges across more than 70 exciting levels. Use your wits and organizational skills to satisfy the needs of your demanding customers! Grow flowers throughout each season, pot them, decorate your plants and earn as much money as possible! You can then expand and upgrade your shop, as well as buy a number of boosters. One last word of advice: customers are always right, and their patience is extremely limited! What's New in Garden Shop - Rush Hour! Requirements for Garden Shop - Rush Hour! Garden Shop - Rush Hour! needs a review. Be the first to review this app and get the discussion started! Garden Shop - Rush Hour! needs a rating. Be the first to rate this app and get the discussion started!